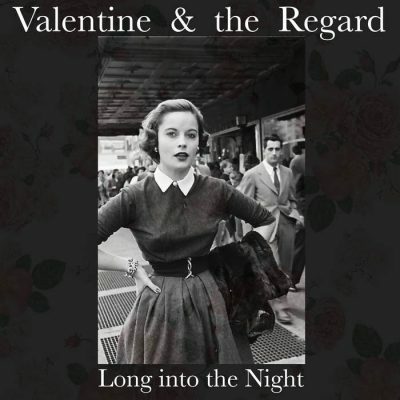 The first mesmerizing track on Valentine & the Regard’s 42-track album, Long into the Night, is a song called “Florida.” A twirling acoustic guitar played by Mike Maurer supports an intoxicating spoken word, by Julie Maurer. This was the perfect introduction for this release. Not only is it soft to the ear; it also incorporates all of the elements that make appearances throughout the rest of the album. One of the songs that caught my attention on this release was “Means to an End.” It’s reminiscent of Elliot Smith and sounds exactly how a rainy day feels. The whispery vocals and poetic lyrics make for a gorgeous, vulnerable song that I could listen to over and over again. It’s a pleasant surprise and a truly amazing song to stumble upon within this album. Since this release consists of 42 different tracks, there’s a little taste of everything Mike, Julie and Collin Jiron are capable of creating. Long into the Night is a collection of songs that range from 2009 up to 2016, which showcases all of the experimental steps that Valentine & the Regard have taken. There’s everything an indie fan could want, all in one album. There are songs with a quicker tempo and playful vocals that stray more on the punk side, like “Brittle Candy”, more singer-songwriter-sounding tunes or songs that are quieter and more on the shoegazy side, like “Driving Across California at Full Speed.” Every element of this release is multifaceted, and every time the track changes, I never know what could be coming my way next.